This non-invasive procedure stimulates collagen in the dermis, tightens your skin, reduces acne scarring, reduces wrinkles and can even out skin tone. All of these benefits are produced through the microneedling process whereby thousands (yes thousands!) of tiny needles are poked through the superficial layers of your skin causing minor pinpoint bleeding and minor trauma to the top layers of your skin. This "damage" results in a powerful rejuvenation process when your body initiates the healing process. Your cells release growth factors which cause all of the benefits listed above. The best part about this procedure is that it is relatively quick (usually 20-30 minutes) and doesn't hurt (too much). #1. Use an electric microneedling pen with lots of tiny needles. This is the preferred method because it provides the best results, but it will require a visit to an office with a dermatologist, plastic surgeon or aesthetician. Using an electric needle pen allows for literally thousands of tiny needle pokes to the skin. The more pokes you get the more rejuvenation you get during the healing process. When people ask about the price of microneedling they are usually referring to this procedure. #2. Use a needle or tip of an insulin needle to poke the skin manually or use something like a dermaroller. But using a microneedling pen isn't the only option. There is an at home option in which you can use a dermaroller (a roller ball with lots of needles on it) or a simple insulin needle tip. It's important to realize that this is definitely a cheaper option, but the results are nowhere near as noticeable when compared to the microneedling pen. If you are in a pinch for money, though, then this may be a potential option for you. We will discuss more about the differences below, but for now, let's talk about the cost. So how much will microneedling put you back if you want to do it? And are the results actually worth it? I have to say that, in my opinion, the results are absolutely worth it, provided you can find a reasonable price. I even have my husband get it done because of how much I love it. So, back to the price. One round of microneedling will cost anywhere from $150 to $600! It's very important for you to realize that this is for only ONE session. Once you get it done you will most likely want to get it done again and again because the results tend to stack on top of each other. Most people can start to see benefits after the first session, but for conditions such as scarring or pock-marking, you may need to get several sessions (up to 6). For anti-aging and skin tightening, I recommend that you get this procedure done at least 6 times. You will notice that with each session your skin gets tighter and brighter which will keep you coming back for more. But why is there such a big price variation between services? After all, isn't it the same procedure? 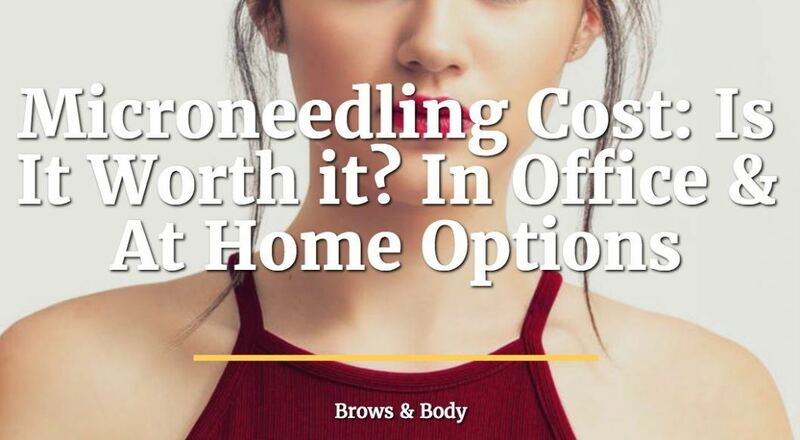 The answer is yes, and the reason for pricing comes from the various costs associated with purchasing the microneedling pen! Health devices (such as a microneedling pen) are quite expensive, usually on the order of thousands of dollars, and the people who buy them have to make the money back. This drives up the price of the procedure. It also creates a price difference because providers don't always pay the same amount for the pen. This means that you can get the exact same procedure for $200 when it would cost $600 at another location. This is why it pays to search around for people with good prices! The short answer is YES, the long answer is MAYBE. It really depends on what you are getting it for and how much you are paying. I recommend searching for someone who will charge no more than $300, but preferably closer to $200 to $250. Microneedling, at this price range, becomes a no-brainer due to how effective it is. If you can't find anyone locally at this price, then it may be a good idea to search for some of the home options available. Another option is to look at coupon sites such as Groupon or Living Social. Most of the time you can find new medspa's which have deals for these types of procedures. The problem with going to someone new is that you don't know if they have a high-quality pen or have any experience. The good news is that microneedling is not necessarily a very "technical" procedure to get done (so it doesn't always matter who you go to). Look for someone who charges between $200 and $300 per session and try to avoid paying more if you can. There is a big difference between "medical microneedling" and at-home microneedling. Medical microneedling is a procedure, usually done in office, in which the needs can penetrate more deeply into the skin. At-home microneedling generally only touches the VERY superficial layers of your skin. But, as you can imagine, the deeper you go into the skin the better the results (provided you don't go too far of course). This makes medical microneedling far more superior, in terms of benefits to you, when compared to at-home versions. At-home versions such as the dermaroller, can and do help provide results, but probably aren't great if you are seriously interested in anti-aging or treating acne scars. The at-home dermaroller is a ball which has needles on top of it which is then rolled over the skin. As the roller goes over the skin, some of the needles penetrate the skin and provide the healing results we discussed previously. The problem is that it doesn't go nearly as deep as medical microneedling. But at a cheaper price point, it may be the only option available to you. Microneedling can be a very affordable and worth-while procedure, provided you get it at the right price. The overall price of microneedling can vary between $150 and $600 per session. Try to find someone who charges between $200 and $300 per session. If you can't afford this price range then you can try some of the at-home options as well. Have you had microneedling done? Did it help tighten your skin or treat your acne?